Though the tourism industry is more well established in Northern Costa Rica, the Costa Ballena (Whale Coast) in Costa Rica's southern region is getting in on the action as well, particularly in the towns of Ojochal, Uvita and Dominical. Parents with little ones shouldn't be discouraged from exploring southern Costa Rica - infrastructure is excellent, driving is easy, and although English may not be as widely spoken as in more touristy parts of Costa Rica, Ticos (local Costa Ricans) are used to tourists and ex-pats, and will try to help. 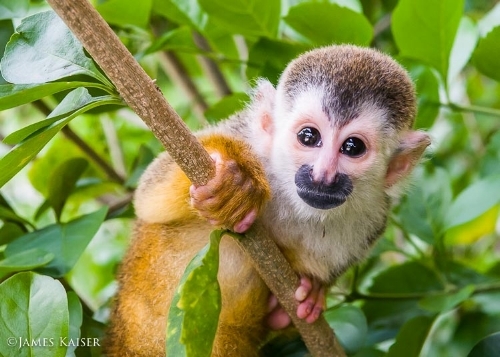 Combine that with southern Costa Rica's beautiful flora and fauna, and plenty of things to do with your baby or toddler, and this destination should please the whole family - especially parents looking for a low-key vacation away from major resort towns. And if a beach vacation isn't a must, but luxury is, then parents should also consider Hacienda AltaGracia, a world-class resort located in a traditional agricultural town, set into the hills of southern Costa Rica. Below are 8 tips for a Southern Costa Rica holiday with a baby or toddler. Expect the beach towns of Ojochal, Uvita and Dominical to be hot! There is very little chance of rain between mid-December and April, though the Costa Ballena experiences daytime highs of 90-95 degrees Fahrenheit (32-35 degrees Celsius) during these months, so bear that in mind if you are considering traveling here with little ones. You'll definitely want to ensure that your accommodations have excellent air conditioning, and that there is adequate shading at the pools and beach for time spent outdoors. If you are traveling to Pérez Zeledón to experience Hacienda AltaGracia, the #1 hotel in Central American (Travel + Leisure 2017), temperatures will be more moderate, with highs between 81-85 degrees Fahrenheit (27-29 Celsius) throughout the year, and lows around 70 degrees Fahrenheit (21 Celsius). In both areas, rainy season starts in the later part of April, when you may experience near daily showers. You'll definitely want to avoid the rainiest months in August through October. As mentioned above, if vacationing with a baby or toddler, you'll want to ensure that your Costa Ballena accommodations come with excellent air conditioning, as it can get quite hot. The beaches are part of Marino Ballena National Park, and as such, are protected for over-development. No resorts or home owners are permitted to build directly on the beach, so wherever you stay, expect a short trip to the beach, whether by car or foot. Many accommodations are built into the mountainside, so read reviews closely, and ask questions prior to booking, to ensure that the accommodation you are considering is safely enclosed for mobile babies and toddlers. Looking for baby and toddler-friendly places to stay in Southern Costa Rica? Many of the smaller hotels in Costa Rica do not have websites, or their websites are very basic, making accommodation research tricky. Therefore, Jenn and Matt, authors of the blog Two Weeks in Costa Rica and parents of a little one that traveled and now live in Costa Rica, suggest using the website Booking.com for accommodation searches and reservations. The site lists whether hotels allow children, and whether they have cribs. You can also send messages to the hotel through Booking.com to confirm crib availability during your stay. When visiting southern Costa Rica, you'll want to fly into San Jose's international airport (SJO). From there, it is a 4 hour drive to Costa Ballena, and a 3.5 hour drive to Hacienda AltaGracia. Direct flights from several North American cities to San Jose are between 4-5.5 hours. Although direct flights are often desirable when flying with babies and toddlers, cost, flight times, or origin city may mean that connecting flights are required to fly to Costa Rica. Said Alana, mother to twin babies, "We made the flight more manageable with stop overs in Los Angeles. My sister lives in L.A., so we stopped in for a short one-night visit on the way down. Then we took a flight from L.A. to San Jose, which is a quick 5 and a half hours." Carefully consider your little one's temperament and sleep habits before booking a red eye to Costa Rica. Since direct flights to San Jose are only 4-5.5 hours from most North American cities, your child won't get a full night's rest on the plane. And while some babies can fall asleep in the airport and sleep throughout the flight, Alana's 1 year old daughter got so wound up from the airport experience and being up past her bedtime, that she cried for the first two hours of the family's red eye flight. But take heart that, even if the flight with your little one is awful, it's only one day. According to Alana, "after we were settled in and relaxed, within a few days, we were saying 'Oh, that wasn't so bad'". Depending on flight times from your city, you may want to consider spending a night in San Jose before departing to your accommodations in southern Costa Rica, to break up travel time. When flying with a baby or child to Costa Rica, you get to skip the airport's customs and immigration line upon arrival. At San Jose’s international airport, this line is often long. If you have kids, look for the special priority line! Most accommodations in Uvita, Dominical or Ojochal do not have direct beach access, meaning you'll need to walk or drive to the beach. Given this, along with the fact that you'll likely want to explore neighboring towns and local restaurants, The Littlest Passport recommends flying into San Jose and renting a car if visiting the Costa Ballena. The drive is approximately 4 hours, on a scenic, well paved road. If staying at Hacienda AltaGracia, you'll likely find that you will not need to leave the resort, as there are multiple dining options and an almost endless number of complimentary activities and things to do with your baby or toddler. Though the 3.5 hour drive to Hacienda AltaGracia is easy and relaxing, you may find it is equally economical to arrange for a driver to take you to and from the resort. Or, if time and relaxation are more valuable to you than money, you can fly into a local airport from San Jose, either on a domestic flight, or by booking a private charter through the resort - its website outlines all options. Check with your accommodation about whether a 4x4 is needed to access its side roads, though this is unlikely. Restaurant dining is al fresco at Costa Ballena restaurants, under a roof covering for shade, but with no walls - and no air conditioning. You may find that eating out for lunch or dinner may be too hot for your baby. In which case, expect to order take out and eat it back in your air conditioned room. If you don't want to feed your little one on your lap inside your hotel room, prior to arriving, ask your accommodations whether they have high chairs. Or consider bringing a lobster highchair with you, to clamp onto counters or even a patio table. Costa Rica's water and sanitation is quite safe. Nevertheless, always consult your pediatrician prior to visiting to ensure that all your baby's vaccinations are up to date, and to learn whether any additional vaccines or medications are recommended. And always confirm that you have adequate medical ensure when traveling abroad! Many places in Southern Costa Rica take credit card, though you will want to have cash as well, especially for roadside dining. US dollars are widely accepted, though it is also good to have some colóns. If you're traveling from Canada, you may prefer to exchange your Canadian dollars to colóns, to avoid getting hit with two exchange fees.